Big cities like San Francisco and New York are digital meccas, home to many of the world’s largest technology startups — and to hordes of smartphone-toting, app-using consumers. But when it comes to making a name for themselves, many of the companies hoping to influence these techie urbanites are going decidedly analog. In these cities, and others, it’s hard to miss the resurgence of old-school, outdoor marketing on behalf of venture-backed technology companies. And we’re not just talking about traditional highway billboards. These days, taxi tops, newspaper stands, bus stands and even the buses themselves — traditionally the turf of local advertisers like museums and the lottery — are blaring messages for the likes of Percolate, DraftKings, Rinse and Jet.com. According to a recent report from Kantar Media, total outdoor advertising spending in the U.S. rose 2.2 percent in this year’s second quarter amid an overall 3.9 percent decline in total ad spend, including decreases for cable and spot TV advertising, online display, magazines, newspapers and network radio. And outdoor marketing spend is up for the first half of this year versus 2014, as well. But is all this tech-company spending on outdoor ads a good idea? When done smartly, yes. Most outdoor-marketing campaigns need to be executed in conjunction with separate (or related) digital campaigns, which leverage incredible data and analytics to improve targeting. But when advertising outdoors — not a venue in which marketers can track clicks and engagement — companies today need to be more strategic and thoughtful in how they place and position these old-school ads. Remember, new technologies like smartphones have fundamentally changed how people interact with advertising they consume in the physical world. Sure, simply having a presence outdoors can help get the word out about a movie or product or new app. And the real-world presence adds legitimacy to tech companies that would otherwise only be encountered in the ether. But I believe outdoor advertisers can increase their odds of success if they evaluate their buys against four key elements: time, place, “state of mind” and creative relevance. All of these increase the likelihood of provoking action, as well as getting eyeballs. Call it the “quadruple-threat” of outdoor marketing. This may sound like common sense, but outdoor marketing needs to be relevant to the time during which it’s being consumed. For example, it makes sense to promote a Salesforce business partner during the Dreamforce conference, or wallpaper bus stops with DraftKings posters during football season. Those are basic “temporal” or seasonal considerations. But then there are the smart outdoor spots (above) from Starbucks, posted in BART (Bay Area Rapid Transit) stations around San Francisco targeting commuters. The ads offer an invitation for commuters to place coffee orders and pay ahead for their caffeine fix, with references to the specific station. And through use of multiple panels, they educate riders on the way the program works while reinforcing the campaign’s overall message. Combined with the relevance of this message to those who frequently ride BART — many of whom are undoubtedly using the train to arrive at work in the morning — many of these impressions (but not all) will be consumed in a way that amplifies their effect. Think about roadside signs you’ve seen promoting wonky tourist traps, like South of the Border, or real-estate ads that proclaim: “If you lived here, you’d be home by now.” What do these placements have in common? They underline the fact that the advertised product is just “X miles away.” These billboards demonstrate the straightforward reason why local businesses primarily use outdoor marketing: Its ability to target consumers in the immediate vicinity. 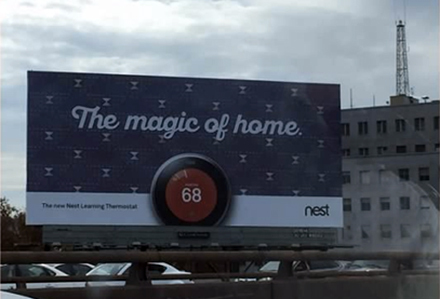 Placing the ad shown above near a highway ramp in San Francisco identifies Nest as a member of the city’s tech community, and probably helped the company get noticed by execs at Google, which bought Nest last year for more than $3 billion. But in my opinion, this marketing doesn’t live up to its full potential by virtue of its placement. Near a home improvement store with some clever reference to tech? Better. Closer to an airport, touting the ability to turn off your thermostat from your plane seat if you forgot to do so at home? Also an improvement. But now let’s look at “place” from the perspective of another advertiser that has more reason to collect eyeballs on the road. 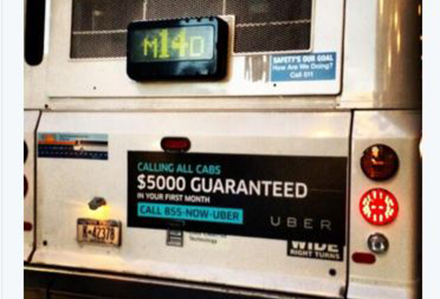 Uber, a ridesharing company you may have heard of, nails place with this campaign on the back of New York City buses. The city is dense with cabs, and this placement on the backs of buses hits drivers perfectly at eye level. Uber is here nailing both place and “state of mind” (the third element of stellar outdoor marketing — more on this below). Time-wise, the ads are perennially relevant. If Uber could change its creative quickly, the company might guarantee $5,000 in income in your first month “when you sign up in November.” And on routes that have a heavy density of Hispanics or Asian-Americans, it would be great to see this ad in the other applicable languages. 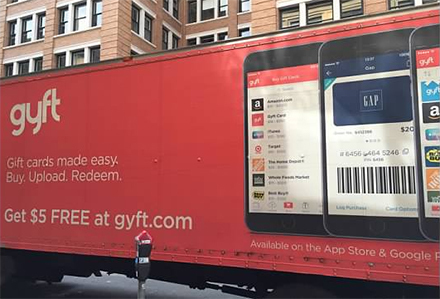 The billboard from Gyft on a delivery truck blocking a city parking spot (above) is good in the sense that it features a mobile phone demonstrating how to make a gift card purchase through the company’s app right now. If the vehicle is parked in an area with lots of brick-and-mortar stores, this could be very effective. But it’s still not as spot-on as the Starbucks and Uber examples. To successfully reach customers distracted by their phones, outdoor ads need to provide information consumers want at that exact moment. They should strive to enhance a potential customer’s actions or well-being. They should complement rather than interrupt what someone is doing. The Jet banner on the side of a bus (above) does not accomplish that. It’s targeting tech-savvy consumers, sure, but only mentions shopping in tiny letters underneath the URL — making it unclear what advantage Jet provides to those walking or driving by. Would you even know Jet competes with Amazon from this placement? 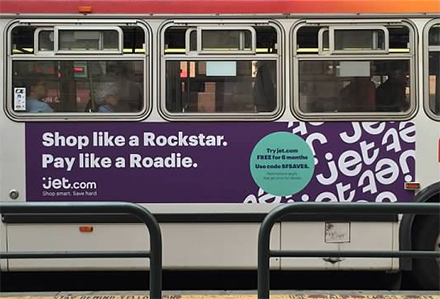 Given the rock star/roadie reference, are they an online clothing store, or a vendor of musical instruments? On a warm October day, there’s no readily apparent time, place or state of mind relevance. Being clever with an actual sign or even the surface on which it’s placed can be highly effective at provoking engagement. Several years ago, the Discovery Channel ran an imaginative campaign for its Shark Week that people still remember today. The network used buses as a canvas, wrapping them with an ad depicting a door in the middle of the bus that was a shark’s mouth devouring passengers. Talk about getting people’s attention. 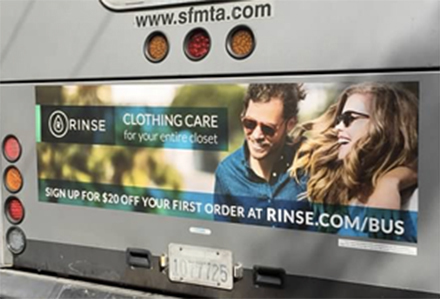 By contrast, the bus signs for Rinse clothing care (above) aren’t taking full advantage of their location. I’ll hand it to the company for using the rinse.com/bus vanity URL for attempting to track who’s taking action after seeing this ad (although my experience suggests most consumers won’t use that URL). In an urban environment, the bus back gets noticed by drivers; is that Rinse’s best audience? There’s not much of a time element to this campaign, and it’s hard to justify state of mind, either. And the creative represents a missed opportunity: Why isn’t Rinse making some clever play on the fact that the bus back is probably dirty? 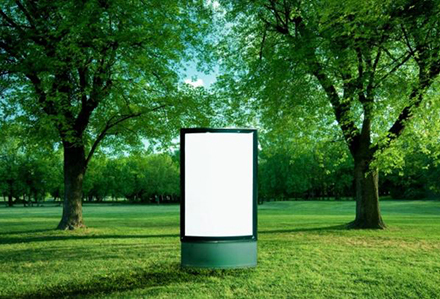 Of course, there are additional factors to consider when buying outdoor ads — a rational cost, how they complement the overall mix of a company’s marketing campaigns and channels, the lifetime value of a customer and more. As an overall framework for evaluation in today’s mobile-influenced world, venture-backed companies should aspire to have out-of-home investments fully capitalize on time, place, state of mind and creative relevance to productively promote growth. In doing so, they can help ensure what’s old — in this case outdoor marketing — is definitely new again. Lamar Advertising Company (Nasdaq: LAMR), a leading owner and operator of outdoor advertising and logo sign displays, announces today that it has acquired the assets of Clear Channel Outdoor Holdings, Inc., (NYSE: CCO) in five U.S. markets. Lamar Advertising Company (Nasdaq: LAMR), a leading owner and operator of outdoor advertising and logo sign displays, announces that its board of directors has declared a quarterly cash dividend of $0.69 per share payable on December 30, 2015 to stockholders of record of Lamar’s Class A common stock and Class B common stock on December 21, 2015.